Wayne Boring bleibt allen Superheldenfans in bester Erinnerung als DER Superman-Zeichner in den 1950er und 1960er Jahren. Boring begann seine Laufbahn bereits 1938 für National Comics (DC) und steuerte in Zusammenarbeit mit JERRY SIEGEL zunächst sporadisch einige Geschichten für den MAN OF STEEL bei bis er schließlich zum Hauptzeichner avancierte. In deutscher Sprache kamen allerdings nur wenige Abenteuer aus seiner Zeichenfeder zur Veröffentlichung. Dies war zunächst in BUNTES ALLERLEI und SUPERMANN in den 1950er Jahren der Fall und später in den ersten Jahrgängen der Superman-Comics aus dem Ehapa Verlag. Viel weniger bekannt ist allerdings, daß Boring in den späten 1960er Jahren HAL FOSTER an PRINCE VAILANT als Hintergrundzeichner unterstützte. Außerdem zeichnete er für einige Jahre an der Taucherserie DAVY JONES, welche ursprünglich von AL MCWILLIAMS künstlerisch betreut worden war. In 1942, the by-then-named National Comics hired Boring as a staff artist, teaming him as penciler the following year with inker Stan Kaye. The two would work together for nearly 20 years. In 1948, following Siegel and Shuster's departure from the company over a Superman rights lawsuit, Mort Weisinger, new editor of the Superman line, brought in Boring as well as Al Plastino and Curt Swan. During this mid-1940s period, he often signed his work for rival Novelty Press' Blue Bolt Comics as Jack Harmon. Boring's "Superman Covers Atom Bomb Test!" cover for Action Comics #101 (Oct. 1946) was an early example of nuclear weapons in popular culture. A more detailed origin story for Superman by Boring and writer Bill Finger was presented in Superman #53 (July 1948) to mark the character's tenth anniversary. Boring co-created the Fortress of Solitude in Action Comics #241 (June 1958) with writer Jerry Coleman and Bizarro World in Action Comics #263 (April 1960) with Otto Binder. Boring was the primary Superman comic-book penciller through the 1950s. Swan succeeded him the following decade, though Boring returned for sporadic guest appearances in the early 1960s and then again in late 1966 and early 1967. As one critic wrote of Boring's 1950s Superman art, "Comics legend Wayne Boring played a major role in visually defining the most well known super-hero in the world during the peak of Superman's popularity. As another writer echoed, "Boring's bravura brushwork defined many of its key elements and made Superman look more powerful and imposing, now standing a heroic nine heads tall, and brought a fresh realism, a sleek sci-fi vision and a greater seriousness of tone. Boring was let go from DC in 1967, along with other artists from the 1930s and 1940s period fans and historians call the Golden Age of comic books. 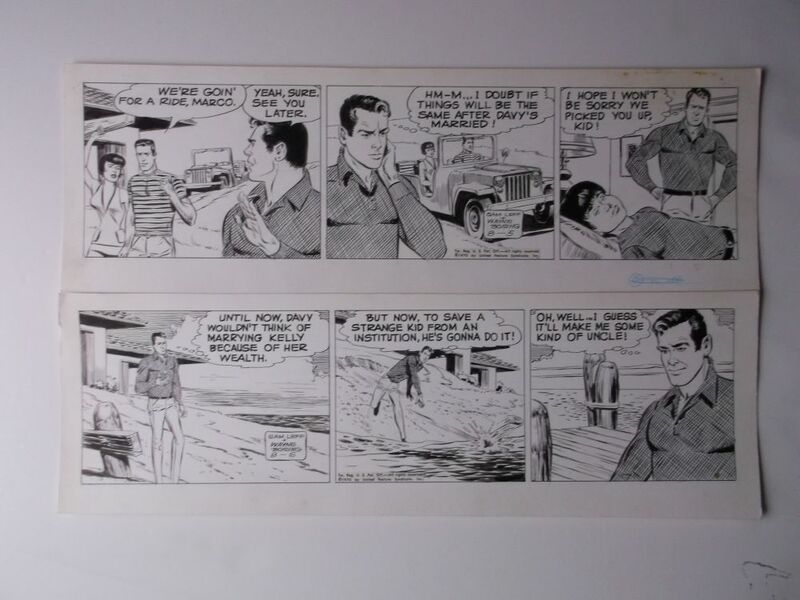 From 1968 to 1972, Boring ghosted backgrounds for Hal Foster's Prince Valiant Sunday comic strip, and took over the art on writer Sam Leff's 1961–71 United Feature Syndicate strip Davy Jones. Afterward, Boring did a small amount of work on Marvel Comics' Captain Marvel, then left the field to semi-retire as a bank security guard, though he would continue to draw commissioned work. He briefly returned to DC to pencil some stories in All-Star Squadron Annual #3 (1984), Superman #402 (Dec. 1984), and Action Comics #561 and 572 (Nov. 1984 and Oct. 1985). In 1985, DC Comics named Boring as one of the honorees in the company's 50th anniversary publication Fifty Who Made DC Great. Boring died of a heart attack, following a brief comeback announced in one of his last published works, penciling a Golden Age Superman story written by Roy Thomas and inked by Jerry Ordway in Secret Origins #1 (April 1986). His final work was All-Star Squadron #64 (Dec. 1986) a recreation of Superman #19. He was posthumously inducted into the Will Eisner Hall of Fame in 2007.